3DS Cheats + flash card? Discussion in '3DS - Flashcards & Custom Firmwares' started by impy101, Jul 11, 2018. So I want to replay some Pokemon games without all the excessive grinding, which is why I plan on using cheats to help me with that. I am planning on buying a Stargate 3DS card so I can play both 3DS and NDS games with it. Is there a way to use cheats with that card or...? Quantumcat is a Patron of GBAtemp and is helping us stay independent! You don't need a Stargate 3DS, and it wouldn't help you with cheats anyway. For cheats you can use the community free NTR, or use a Gateway card - which isn't recommended because it requires lower firmware, is dangerous, and is harder to set up (unless you have a really low firmware, but even then it is a bit inconvenient to use). Recommended solution is to set up free CFW by following https://3ds.guide (if you are on 11.4 or higher you will need to buy a flashcart, or use the seedminer method which costs about $2) and use NTR for cheats. So wait, I no longer need a flash card to play games? Nope. You'll need one for DS games, but that's all. Well that's not too bad. Those are pretty cheap nowadays. I thought I was going to have to buy an expensive card to play 3DS games as well. So which card to you recommend for NDS games (that I can use cheats on)? I'm not too sure. But this has been asked a few times so try searching on google by using 'site:gbatemp.net' (to get results only from here) in your search, and maybe 'recommended DS flashcart cheats'. If you need the flashcart to install CFW, the easiest option is to get one with a switch so you can change between ntrboot flashed and normal (for playing DS games) very easily. I want to add to this because you can also use a flashcart (I suggest the R4i Gold Plus) to install B9S using the NTRBoot method. This method is easily one the easiest and most recommended methods for hacking the 3DS. Plus with the cart I suggested, you can switch between NTRBoot and NDS Mode. Bluespheal and Quantumcat like this. Hmm, there's no plus version in my country. How about the R4i Gold Pro? I have no idea what that is, but I can always learn. Fact is; the plus variant is not available. Otherwise I have to ship from outside the country and that could turn out to be expensive. If you have any other recommendations then I'm always willing to listen. An Acekard 2i is also a good card, although they're not in production anymore as far as I know. Some sites still sell them though. A timebomb is basically a purposely set date in the kernel for the cart that deactivates the usability of the kernel in order to force you to buy a new cart. Retro's files provide a homebrew kernel called "YSMenu" that can bypass this timebomb and allow you to continue to use the cart past the time the "expiration date." What I can recommend really depends on what other systems you have laying around. Every single cart on the market made by the R4i-SDHC team can be flashed to run NTRBoot, but they all have a timebomb in the kernel. 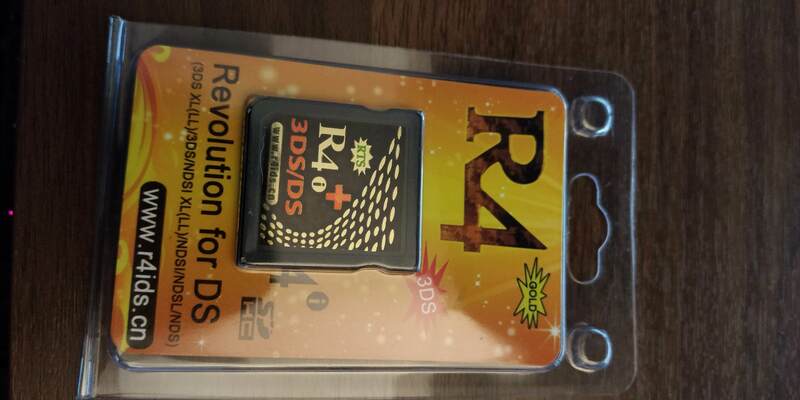 Regardless my second suggestion would be the R4i-B9S, since it comes pre-flashed with NTRBoot and can be flashed back to a normal R4i-SDHC. Or saving a couple of bucks and buying just a normal R4i-SDHC and flashing that with NTRBoot. There are other methods, but some like the Ak2i or DSTT require additional hardware to flash NTRBoot onto. Actually there are some 1:1 clones still being made that function the same and still work with NTRBoot. The only issue is that they don't work on anything above 4.3, so they require either another hacked system or a DS(lite/phat) or DSi 1.44/below. Ah, right, I totally forgot that you need a hacked 3DS/DSi or a DS to set up NTRBoot on an Acekard 2i. Good point! To hell with that. I will order the card you suggested. I went to the official site and found an official reseller that has free shipping. Sure, it'll take a few weeks, but I'm a patient guy. Thanks for all the advice so far! Do you have a link to a guide for me so I can make this baby work? Yep, found it. Seems to be working nicely. Is there a "timebomb" with this card that I need to be aware of? That...idk, maybe @Lilith Valentine could have a clue if it does or not. No timebomb, and it has a switch inside to switch between ntrboot, and DS mode, so no need to flash the card. Switch to ntrboot mode, install CFW then switch back and play your DS roms. EZ Flash Omega cheats mostly in Chinese. Problem with cheats on my ez flash omega. Can't use cheats on EZ Flash Omega.